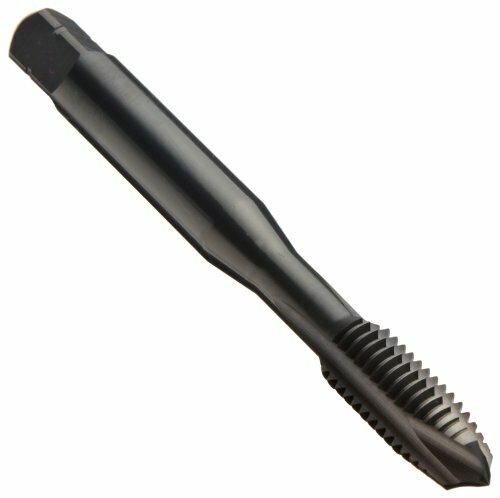 The Dormer MTT-X E001/MTT-X E011 powdered-metal steel spiral point tap has a round shank with a square end, black oxide finish, and a plug chamfer, and is used to create metric right-hand threads in a number of materials, with best performance in steel. It is available in two different thread specification standards: Metric Coarse (M) or Metric Fine (MF). The spiral point of this tap (sometimes referred to as a “gun tap”) pushes chips ahead of the tool and the straight flutes reduce clogging. Both characteristics make it suitable for threading through holes (extending through the workpiece). The black oxide finish improves lubricity, resists corrosion, and will not chip or flake. It also helps to prevent buildup and welding of material on the tap’s cutting edge when working with iron and steel. The plug chamfer distributes cutting to ease tapping at the beginning of the hole and to maintain correct perpendicular alignment with the workpiece. In the Dormer MTT-X E001 series, taps with nominal diameters of 3 mm to 16 mm have three flutes and taps with nominal diameters of 18 mm to 24 mm have four flutes. In the MTT-X E011 series, taps with nominal diameters of 4 mm to 16 mm have three flutes and taps with nominal diameters of 18 mm to 24 mm have four flutes. All taps in both series have plug chamfers. This tap conforms to ISO 529 standards and can create threads to a depth two-and-a-half times its diameter. It is suitable for the 6H tolerance class: 6H is used for a normal length of thread engagement and medium tolerance quality.